It's been a while since I grabbed a Smuttynose Brewing beer, not really sure why. But a label with a rhinoceros on it caught my eye a few days ago. 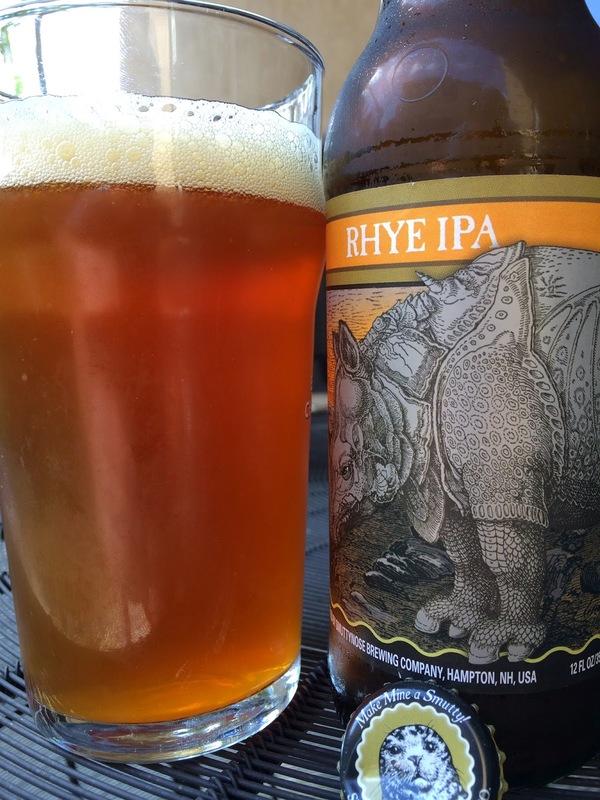 And the name, Rhye IPA, what the hell is that? Well it's a combination of the rhino and the rye that the brewery used while brewing the beer itself. Best By 08/11/2015. Spicy, citrusy aroma. Giant spicy flavors to start on top of a lot of pine. Those give way to some orange citrus, sweet and zesty at the same time, kind of interesting. A light caramel sweetness adds another element of balance right at the finish. The finish is also very dry with a light touch of alcohol noticeable. Pleasant lingering aftertaste. Good balance with sweet and bitter and spicy and alcy. I liked it and will go to see what other Smuttys are on the shelf next to this one!